Edinburgh is currently in the process of getting a new tram system, this has not been without controversy, not least the issue of cycling and tram tracks. The early threat to the off road cycle network, the removal of on road cycle lanes and would bicycle be allowed on the trams, were a few of the issues. Fortunately the plan to replace an off road cycle track with the tram was dropped before work started. Also the tram company, TIE, offer to carry bikes on the trams, not something which was in great demand among Edinburgh’s cycling community. Most of us are quite happy to ride our bikes to where we want to get to, if we allowed to. This is just as well as the City of Edinburgh Council has signed the Charter of Brussels committing it’s self “To set a target of at least 15% for the share of cycling in the modal split of trips for the year 2020 and of further growth if this target already is achieved.” The greatest problem appearers to be a lack of thinking about how integrate the new tram system into the existing transport network, rather than just adding to it and expecting it all to work together without any further planning. The first street in Edinburgh where tracks have been laid for the new tram network is Princes Street. So when Princes Street re-opened two weeks ago, there was great interest in seeing how the new mix of trams, buses, cycles and taxis would work (cars are not allowed on most of Princes Street). OK, so there are no trams yet, they won’t actually arrive for another year, which is just as well, as there are things which need to be sorted out before they do. 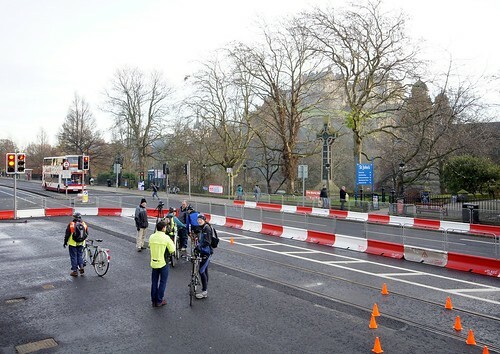 As soon as Princes Street reopened, people went to see what it was like and took the opportunity to cycle along it for the first time in a year. Almost straight away, there were reports of strange signs, a lack of cycle facilities and accidents. 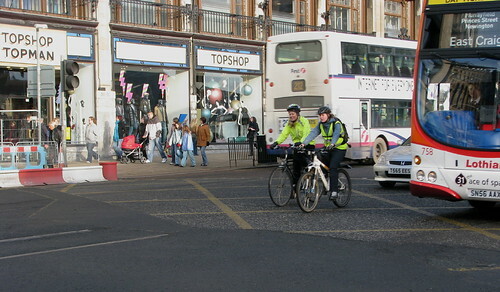 It was this sudden spate of accidents that prompted TIE to act and offer training to Edinburgh’s cyclists. Now, I am all in favour of training , especially when there is someone to pay for it, and so it was that I found myself on a Sunday morning on Princes Street with a couple of colleagues from the Bike Station, giving advice to cyclists on how to cross the tramlines. I was stationed at the west end, where there was a section of the street which was conveniently blocked off. When we first arrived, we looked for a place to lay out cones and noticed there was ice everywhere, as the sectioned off area had not been gritted. There was no one from TIE around to ask about getting some grit put down, so we were left with having to tell people to watch out for ice (until it melted away around midday). However, this still allowed us to explain the principles of how to cross the rails safely to the cyclists and give them opportunity to practice in a traffic free environment. Photo copyright Chris Malcolm 2009.
once you have started to cross, keep the bike in a straight line, do not change your balance, as this can cause your wheels to slip. If your wheel should drop into the tramlines, those with skinny tyres are most at risk of this, stop and lift your bike out. Photo copyright Duncan Wallace 2009. Having had this practice, they were then offered the opportunity to ride along Princes Street, accompanied by one of my instructing colleagues. Photo copyright Chris Hill 2009. Overall the training session was a success, with everybody who took part saying that they felt more confident about cycling with the tramlines. For me, the one downer of the day came when I was cycling back along Princes Street. I had moved across between the tramlines to pass a bus, wanted to cross back again and checked to see that I was well past the bus before starting to cross the rail. I turned to cross the rail at a 45°, but without thinking, I took another look back, and my rear wheel slipped and down I went. This evening I was talking to my mother on the phone and telling her what I had been doing. She then told me about cycling in the city when she was young, before they removed the old tram tracks. She said the worst thing was going downhill, getting a wheel stuck in the tracks and going over the handle bars. When I said I had come off, she commented “well at least you weren’t wearing a skirt”. Cycle parking, a new opportunity in Edinburgh? Cycle parking in Edinburgh, where have we got to? From experience of cycling in Sheffield when the tramlines were introduced there in the 1990’s I would recommend avoiding cycling along any route with tramlines if the ground is wet – the rails act like a patch of sheet ice in the wet especially with narrow section tyres. When changing direction on a bike (as when turning, overtaking parked vehicle etc) you lean slightly in the direction of turn and this can be enough for your wheel to slide from under you. Fortunately when I came off in the middle of West St Sheffield there was no vehicle near me and it was mostly my pride that was hurt! tracks at as near as possible to 90 degrees and no less than 60 degrees. So, tough, it’s designed properly so it must be poor cycling! However of the problems is that if you are riding west along Princes Street the track start, without warning, just after the Waverley Bridge junction. Important special note – All crashes or other incidents relating to tramlines should be reported to TIE, who are keeping a record and using this to try and identify problems which need addressed. The preferred reporting method is freephone 0800 328 3934 [TIE is drawing up questions to be asked about this] or you can email info@edinburghtrams.com or write to Freepost RRYA-BBTU-HAUB, Edinburgh Trams, EDINBURGH EH12 5HD. Please report such incidents even if they were in the past and you have only just discovered this reporting method, and even if you have already notified the police or anyone else. These contacts can also be used for any queries about the tram or tramlines. "Maths illiteracy strikes 8 out of 5 people."